A special day indeed… the four year anniversary of my Monday meeting! Lots of people (22, which I insist is a record high but others insist we’ve had more), a lot of great food, and, as always, tons of great wisdom and camaraderie. Two “soberversaries” (16 years, 3 years) added to the jubilation. I was about 6 months sober when a new AA clubhouse opened up about 5 driving minutes from my house. A daily meeting attendee at the time, I was thrilled. One meeting in particular was perfect for my schedule, and so I started attending faithfully. The woman who ran the meeting told me the clubhouse needed a lot of support in order for it to remain open, and suggested I start a meeting of my own. She said I’m more qualified than people with years of sobriety, and that people would come, I just had to show up. For two months, she continued to badger me about this, and had others get on me too. In the end, they wrangled me into doing it using my inbred Irish Catholic guilt… the club house needs loyal people! The underlying fear, the absolute disbelief that I was capable, was a theme in my life. That black and white thinking was pervasive, and allowed for no other possibilities; either I believed I could do something, and therefore I would, or there was no chance in hell I believed I could do something, and nothing anyone said or did would convince me otherwise. Four years later, I get to tell that story to a roomful of people and laugh ruefully at my closed mindedness. As it relates to sobriety… well, you can imagine some of the unmitigated thoughts I had. I remember saying to someone, “Wait, are you saying I can never have a sip of alcohol again?” And my mind rejected that thought as if the suggestion was I couldn’t drink water again. Or when I first started attending meetings and people would identify as grateful recovering alcoholics, and I assumed there were either pathological liars, or just pathological. Or when someone would share they’ve been faithfully attending meetings for decades, and I’d feel sorry for them, thinking they must have nothing and no one in their lives and therefore just spent all day in the rooms of a 12-step meeting. Yes, I would say there were one or two old ideas of which I was wise to let go. Nowadays, I am working on letting go of more elusive ideas pertaining to myself, limiting beliefs that I’ve held for so long they feel like they’re almost part of the fabric that is me. I’m a work in progress, but I’m grateful for every bit of that work, as it means I’m heading in the right direction. Others stayed in denial because they did not fit the image of an alcoholic. They still had their job, their home, their spouse. Surely they were not an alcoholic if were able to hold on to all these things! Some resisted sobriety due to old fears of what sober life would look like… humorless, lackluster, tedious. Life without alcohol = life without fun. Again, the choice in most of our cases was to continue on a path of known chaos and misery seemed better than the uncertainty of a life without alcohol. Meetings that remind me of how far I’ve come in my thinking, my actions and my very way of life are the best kind, as they bring to mind how grateful I am for the life I live, and validate why sobriety is a priority! I received news this week, good news, in the form of a package in the mail. News towards which I have been working for nearly 3 1/2 years, longer even than my sober time. In the interest of privacy, and brevity, because the story could fill the pages of a novel, the package in the mail put a final period on the sentence: The consequences of my addiction. Hmmm… come to think of it, that isn’t even a sentence. Oh well. Someone once joked that the period of time waiting for this package was longer than the period of active addiction; depending how you define active addiction, that is an accurate statement. So how did I celebrate this milestone? Did I call every person I know, shout it from the rooftops, rent a billboard along I-95? None of the above; some friends or family may in fact be finding out the news by virtue of reading this post (sorry guys). So what gives? I’m not sure, and of course, I am using my old stand-by of this blog to help me figure it out. The first thought that comes to mind when I pose the question why aren’t you more excited about this incredible blessing is: disbelief. It’s been so long in the making, there have been so many setbacks, I feel like doubting Thomas, needing to put my fingers in the side of Christ before I believe He has risen. The paperwork is in my hands, and I’m still making phone calls in order to verify its existence, for Pete’s sake! But I think, skepticism aside, there’s something deeper at play here, and, ironically enough, I think it has to do with fear. Ironic, of course, because the very post before this one I wrote how I can’t figure out how fear plays out in my life. Be careful what you wish for! So of what am I fearful? I’m still uncertain, I mean, really, it’s only been a couple of days since I wrote that I don’t understand fear, how much could I have possibly learned in a couple of days? On the most obvious level, while the package represents the end of the most tumultuous time in my entire life, a good thing, by extension that means it also marks the beginning of a new era, and change will be afoot as a result. Who isn’t a little fearful of change? There is also a fear in trusting a process to do what it is supposed to have done, and I can say with certainty fear in trusting that process is an issue. Human error occurs all the time, I know I make mistakes, what if I trust this process and I wind up getting burned? It’s like jumping out of an airplane and trusting that the parachute is actually going to work, certainly that fear is going to run through your head at least for a split second, right? It might even keep you from jumping. Note to self: now that I’ve written that, I will not let this fear keep me from jumping, dammit! See this solution-by-blogging thing is already working! Finally, and this is the part that is still somewhat elusive, almost hazy, in my mind: I think there’s a fear in letting go of this part of my identity. Which is a really strange thing to say, given that it is an entirely negative identity (I mean, I’ve labeled it consequences of active addiction, the title alone should indicate how negative it is). For the first year of my sobriety, I struggled to come up with a solution for resolving the consequence, the second year, I did the hard work to resolve the consequence; the last year and half was the fight to get my hard work recognized so that the resolution would actually happen. And now it has, and, I don’t know, there’s this crazy, almost empty feeling. Really, really strange. And yes, now that therapy that I keep “dissing” will come in handy, perhaps my therapist will help me better understand. I hope to have a positive update to resolving this hazy fear next week! Childhood China: The Complete Collection! This post will appeal to all the hoarders of the world! So, yesterday, I revisit in a slightly more serious way the subject matter I’m about to discuss, even took some pictures (see above) in preparation, but still don’t have that really concrete “hook” for the post itself. When this happens, I employ a very simple process: slow down the monkey mind, and ask myself the pointed question, “what are you feeling?” The answer that came was, “I’m not ready to let go.” Which gave me the title for the post, also written above. Then I vaguely recall writing something with a similar title, but the hell if I feel like scrolling back through 400 posts to find out if I am remembering correctly, so I figure I can come up with something more original. I finally force myself to sit down and attempt to write something; because I want to procrastinate, I take the long route to the blank page, and go via “Dashboard.” I kid you not, I never visit this page. For quite some time now, I sit down and look at very specific things on my blog, and I pointedly ignore the dashboard page because otherwise I will get too caught up in the statistics of the blog. So here I am on the page that I never view, and I click, for no good reason, “view blog,” again, something I never, ever do (which actually was fun because I viewed the blog the way the rest of the world does). On the right hand side are various ways to scroll through the blog, one section is called “Top Posts and Pages.” Number 3 on that list today? If you had asked me, prior to recent self-examination, to place myself on the spectrum of Sentimental/holds on to every memento ever received – Unsentimental/throws away everything but the kitchen sink, I would have placed myself in the middle of the spectrum, possibly leaning towards the unsentimental side of things. And I think, perhaps, that I have been suffering a bit of self-delusion. 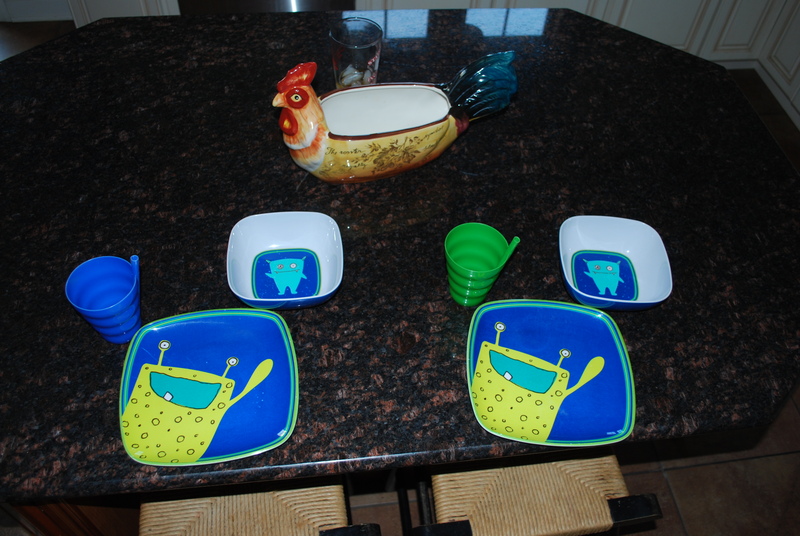 Here comes the big reveal: the dishes above are the dishes from which my kids eat at almost every meal. They are the same ones they have been using for, I will say, close to eight years now. I seriously just stopped typing and put my head in my hands. When I type it out this way, I realize the insanity of it all. My daughter is about to enter high school, and she is using the same plate and cup that she used in first grade! And, indeed, I do have a problem. My husband has been gently prodding me to get rid of these dishes for quite some time now, and each time he gets a little less gentle. 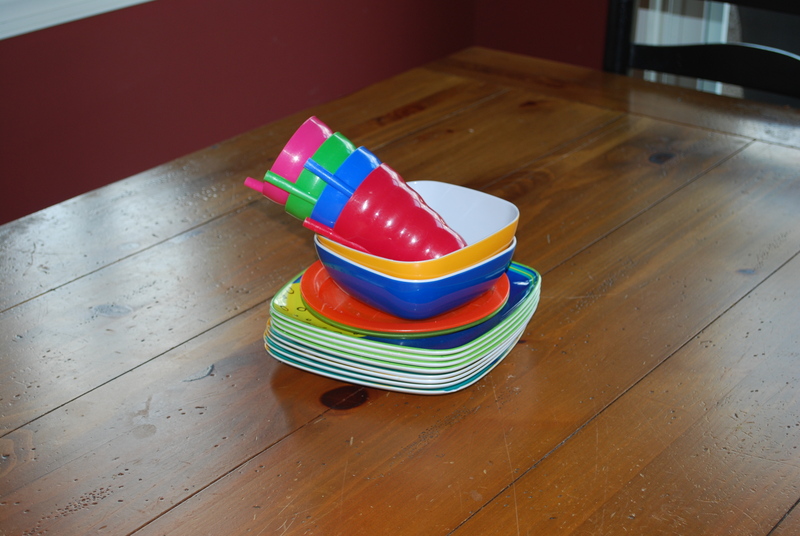 Yesterday, as I am organizing the house for some out-of-town visitors, I came across some old, barely used melamine dishes that I had once used as patio dishware in our old home. We don’t have a patio now, so they have, in essence, sat in storage for the past 8 years. Now, the reason I have been citing as an excuse to keep the current dishes in rotation to my husband is that they are kids, and thus cannot be trusted with glassware and fragile plates. We have granite counter tops, and a ceramic floor, so when things break, they really break. Why bother with this kind of danger? I will just wait until the next big sale at Kohl’s, get some Corelle, and then I will get rid of the kiddie-ware. Except, of course, that I never actually went looking for those sales, I would conveniently forget to do that every time I went shopping. Or I would wander past, and then decide it’s too big a decision to make by myself, so I’ll wait until someone is with me before I actually purchase. So when I came upon the solution to the dishware dilemma, right in my own home, I knew the time had come. And I gathered up the dishes, put them in a pile to be thrown out (last night was trash night), and kept on going with the organizational work. I wound up accomplishing a lot yesterday, and had many bags to put out by the curb. 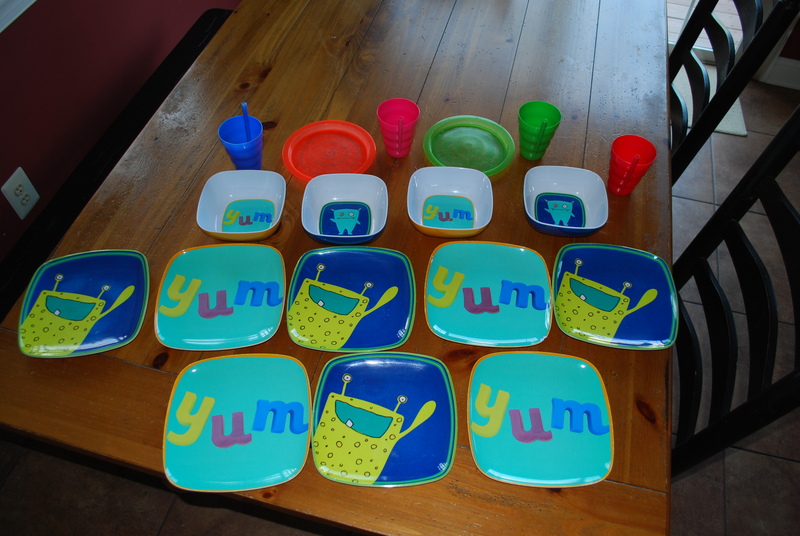 But the only thing that didn’t go out: the pile of kid dishes. First rationalization: I want to take pictures since I am going to write about it. Got that done, still plenty of time to gather them up and walk them to the curb. Second rationalization: The “new” dishes I found didn’t include bowls, what if the dishwasher hasn’t been run, and the kids want ice cream for dessert? The new centerpiece for my kitchen table! I keep reminding myself that I am not overly emotional, nor am I overly attached to sentimental things. I just came across my wedding album, that had been severely damaged in a basement flood. I was glancing through it, and it was much worse off than I realized. I was disappointed, but certainly did not lose any sleep over it. So why can’t I throw out these dishes? I really can’t get a handle on it, but I know that there is something almost physical that’s stopping me from pulling the trigger on this thing. I refuse, I mean REFUSE, to box them up and store them away like they are memorabilia, so that’s not an option. I’m writing this without a real solution, or “a-ha!” moment (I was kind of hoping one might come to me as I type, no such luck), I guess the best I can say for myself is that taking them from their rightful place in the cabinet, and replacing them with other dishware, is certainly a giant leap forward. Now, if I can just purchase some fun, sassy replacement bowls and cups, then maybe , just maybe, by next trash night, I will be ready, once and for all, to say good-bye to the childhood china. That my kids are as well-adjusted as they seem to be, given the idiosyncrasies of their Mother? I’ve been dealing with two different issues that have remained unresolved for long enough that I thought I needed to make a decision: either keep trying different strategies in the hope of enacting change, or let go of the situation entirely and decide that since it is out of my control, then I should remove it from my life. Neither of these options was sitting well with me, so I figured I would sit down and write about it. In looking for an image to correspond to this writing, I came across the one shown above. And I am so glad I did, because it really gave me some clarity for both of the issues with which I’ve been grappling. The two situations are entirely different, involving people from different parts of my life, but in the end the struggle I’ve been having involves the same thing: I am putting myself, and my thoughts of what is right and wrong, front and center, when in fact I am almost completely immaterial. In other words: there is a God, and I’m not Him. In both cases my motives are pure enough, I want what’s best for people who are struggling. The problem, of course, is the idea that I know what’s best, and that I think I hold the answers to solve anyone’s problems. Pure, unadulterated ego at work. I have known for some time that my all-or-nothing thinking rarely gets me anywhere productive. The notion, “well, I tried, you’re not listening, so I’m done” is an attitude that I have used, unsuccessfully, in the past, and I’m not sure why I hang onto it. After all, what if anyone in my life had acted on that thought with me when I was in active addiction, where would I be now? I shudder to think of what my life would be like today if that were true. So the key for me (as it usually is) is finding the balance. Balance between being helpful and supportive, but not being overwhelmed or consumed by the problems of others. Balance between being there for people, but creating healthy boundaries for myself. As with all matters, I am a work in progress, but the self-awareness and consideration before action are definitely areas of improvement for me! A little more than two years ago, my husband had to cancel a business trip because of my active addiction. Today, I am more than halfway through a week with him away on business, and all is well. I am so grateful that my sobriety has brought back the trust in our family!